A passion for sport, determination to climb the ladder, and accepting the need to work long, unsociable hours are a standard requirement for all working in sports broadcasting. Director Gemma Knight is no exception. 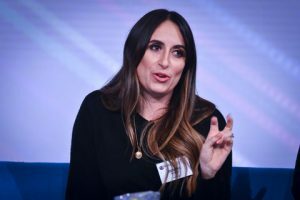 This rising star is one of BT Sport’s junior directors, and over the course of her career at Sky Sport and BT Sport, she has used a dogged resolve to move forwards towards her ultimate goal of being a director. 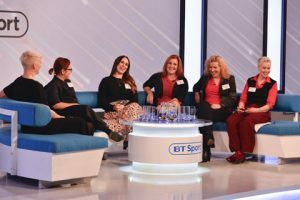 Knight was brought into BT Sport to work in its Champions League team, but since she began working for the broadcaster in 2015, while working primarily on the football team she also works on in-house productions including Speedway, hockey, including the 2018 Women’s Hockey World Cup, and other sports. And so in 2005 Knight started out running across all sports at Sky Sports. Over the course of just one month her shifts built up to one and sometimes two shifts per day at Sky all in live studios, and she adds, “somehow a shift on Soccer Saturday came up, which was a great opportunity; runners could gather clips, research and help reporters, not just make the tea”. Finally Knight got her chance to prove herself, compiling clips requested by the FA for the Kick it Out Campaign. Andy Melvin, then head of football at Sky Sports, who retired as deputy managing director in 2013 after 22 years at the operator, who, says Knight, “was notorious for being an important and scary man,” had made the request and Knight ended up tasked with the job. 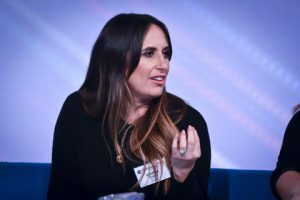 When Knight noticed that BT Sport was struggling to find EVS operators, she asked her boss, director of production Fergus Garber, to set up an inhouse course on EVS operation. This very basic EVS course covers one day’s training per week over four to five weeks for in-house members of staff, and has been a great success in covering that gap in operations, states Knight. 2018 has been a great year for Knight. Since the beginning of the season this year she has been directing on The Champions League Goals Show, as well as directing all FA Women’s Super League (WSL) matches, England under 21’s men’s games, the England Women’s Internationals and some FA Cup men’s matches. She comments: “Getting to direct the matches as a woman was a huge deal for me, as there is only one other established female match director in the country so it’s a great achievement.” She also directed presentation on her first Premier League Game recently Leicester, another milestone, and directed the matches in the EE Cup, which was the first sports broadcast over 5G shown on Youtube. She comments on WSL, where she is providing a production point of view in the remote production project on BT Sport COO Jamie Hindhaugh’s technical team, which is looking to increase the league’s coverage: “With WSL it’s a bit of a transitional period for us at the moment, but we have ideas on how we can help push the WSL coverage, with opportunities to explore remote production; the WSL and National League is where we see that fitting in really well, and with remote broadcast we can afford to cover a lot more matches which brings more football to the viewers.” The team had its first remote broadcast on the WSL recently in the Manchester City V Birmingham match, which was a great success. The football team at BT Sport today consists of 16 people, three of whom are women, says Knight. There are three male producers, three directors – one of which is a woman – and around 10 assistant producers, of which two are women. “That’s still not representative, but it will change and it is important it changes,” says Knight. In conclusion, Knight says of her career as a woman in an area of sports broadcast typically governed by men: “My experience is unique because it’s in football; it’s always the most male dominated area of broadcast because it’s the male sport. But what we’re seeing is the women’s game is coming through, so you’re seeing a change in that dynamic on and off the screen.